Specialty manufacturer Tonar (http://www.tonar.info/en/) has introduced a new tipper trailer to meet the needs of customer ALROSA in Siberia. The new model 95405 trailer is designed to carry 117 metric tons of rock over long distances. The 45252 tractor is equipped with a 600-hprsepower 18.9-liter 6-cylinder in-line turbodiesel Cummins QSK19-C600, and 7-speed Allison 4700 automatic transmission fitted with a retarder. The tractor’s front suspension is pneumatic-hydraulic. Size 14.00R25 tires have a load capacity index of 170. Tonar continues to expand its range, in which off-road dump trucks constitute an important part. 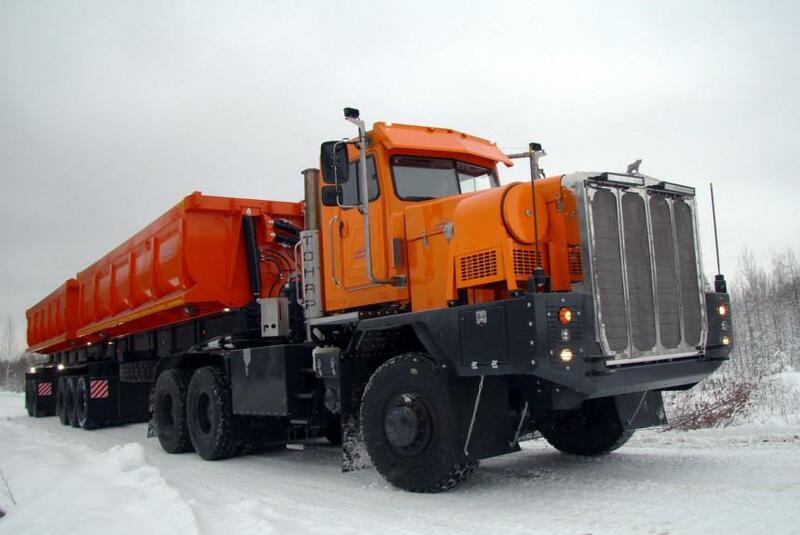 Recently, the company’s newest dump truck giant has just come out for testing. The eight-axle combination with a total weight of almost two hundred metric tons and a length of twenty-eight meters is designed to carry 127 tons of ore. 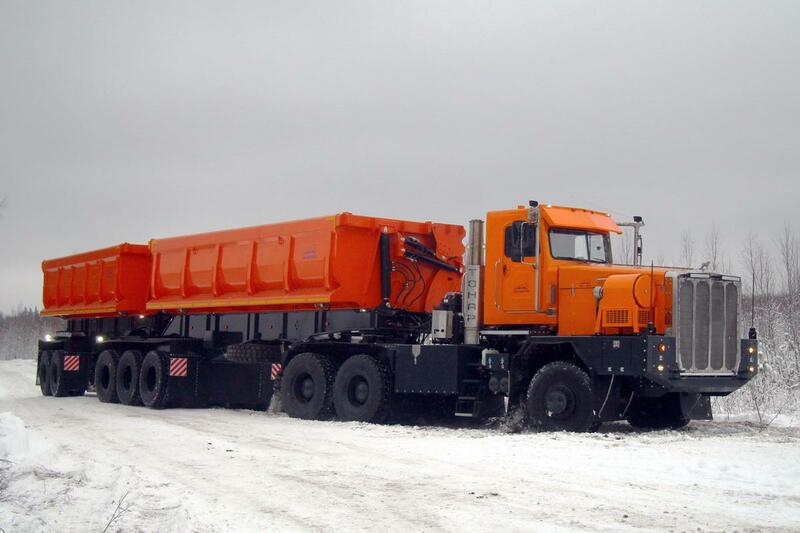 The all-wheel drive Tonar model 7502 6x6 tractor is nine meters long and over four meters tall. Under the hood is a 19-liter 760 horsepower Cummins QSK diesel engine paired with an Allison automatic transmission. The suspension and axles, produced by Tonar, are based on Chinese Hande’s designs - 13 tons in front and two 25 tons in rear. Tires are size 14.00 R25, and the two fuel tanks each have a capacity of of 610 liters. 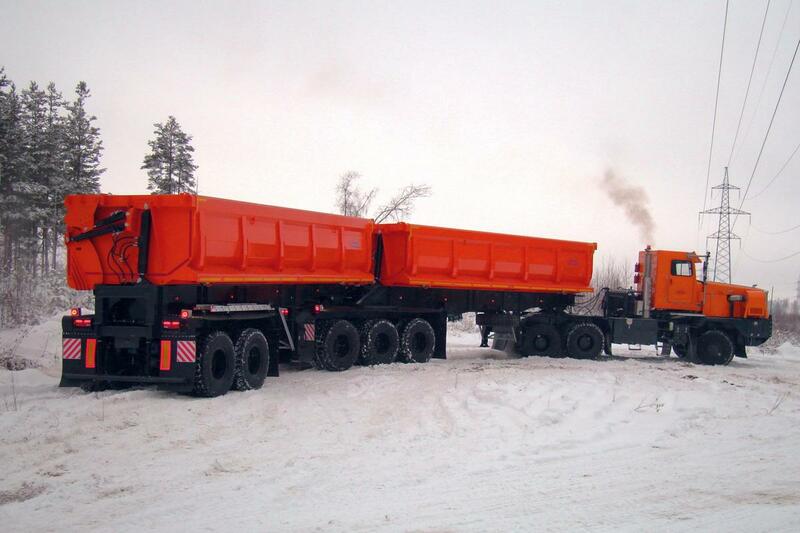 The cargo is transported in two nine-meter steel side-dump trailers with Penta hydraulics. It’s an Australian market B-Train design, with the first semi-trailer also has a saddle on which the second rests. Tonar’s future plans include a six-link 400-ton road-train.